Gift wrapping is available by setting at [Other Settings] > [Gift Wrapping] on [Shipment Request] screen. Wrapping method can be specified for per order (box) or item. *Not available for more than size 100. *Although the color can be selected, the chosen color may not be available depend on the inventory condition. * Items are shipped with materials with an appropriate size. Still according to the shape of item, the packing style of bubble wrap and gift wrapping some item could be packed with a relatively large package for the registered item size. Gift wrapping charge will be set based on the size. 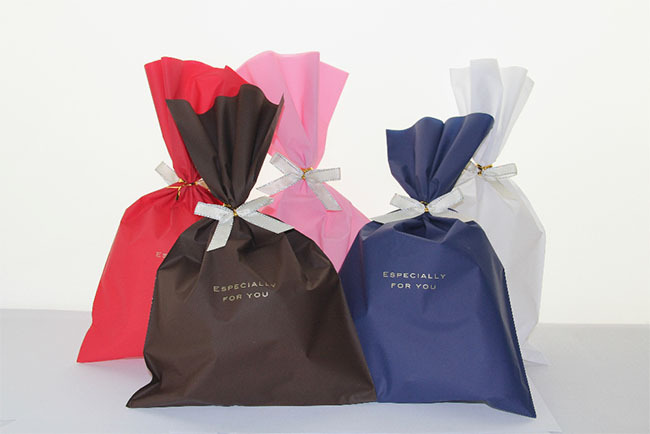 *For wrapping more than one unit items in a package, additional charge arises on per added item and the price are 80 yen for ss size, 100 yen for size 100 and 150 yen for size 80. When gift wrapping is selected, as the box is supposed to be delivered directly to the receiver the check on ‘Print out the price on detailed statement’ will be unchecked automatically so as not to show it on the included detailed statement. *Checking on ‘Print out’ will shows the price on the detailed statement. *For C.O.D.shipping, the price will show. How can I arrange a shipment for an item with included article? What kind of packing material do you use? Let me know the sizes of the cardboard box used at shipment.